Our 8 oz scented candle tins have a lot of fragrance in them. These larger travel candle tins will freshen the air in any room in your home. 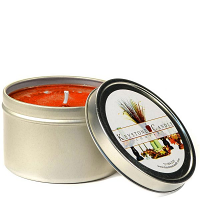 These scented candles are great to use as wedding favors, bridal showers, baby showers favors, and gifts. 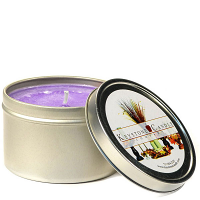 If you need personalized candle tins we can do that for your too. Toss one of these affordable candle tins into a zip-lock bag to take on trips with you. Most hotels and motels will not allow you to light a candle in the room but placing one of our tins on the night stand with the lid off can still freshen the air. We make a wide selection of fragrances to choose from so you are sure to see something you like.